The X80 Proto in Grand Theft Auto Online. "The cause of more UFO sightings across San Andreas than any other production vehicle of the decade, the Proto is the kind of concept car you get when your head of R&D is an 8 year old child with a stack of comics and a bowlful of MDMA. The future is here." The Grotti X80 Proto is a prototype hypercar featured in Grand Theft Auto Online as part of the Further Adventures in Finance and Felony update, released on June 21st, 2016, during the Power Play Week event. The X80 Proto is the first car in the series to be based on a concept hyper/racing car, namely the Ferrari F80 Concept, as seen in the frontal styling, especially in the grille area, side profiling and intakes, it also a bears strong resemblance to the Devel Sixteen. The headlights are extremely sharply shaped and large, and progress from the interior of the frontal intakes to down the sides of the front fenders. Through the front windshield, two adjustable shock absorbers and springs for the frontal suspension can be seen. The horizontal alignment of these suspension components implies the usage of a pushrod-actuated front suspension setup. On the rear of the main cockpit, the rear window is split in two by a large strip of carbon fibre. The side features a large number of progressive curves which originate from the front fenders and curve down to the bottom of car, directly in front of the wheels. From there, two large intakes open on either side; one of which leads towards the engine bay for general cooling and ram-intake air, while the other flows into the rear wheel arches and provides cooling air for the rear brakes. The rear of the vehicle is very exposed in that no bumper is seen hiding the rear fascia. The cockpit of the vehicle curves to the very end of the back of the car, where it narrows into a thin, streamlined hexagonal polygon, at the end of which is a small grille with the license plate fitted within. A small F1-style red braking light can be seen placed directly underneath this grille. Two rectangular exhausts exit either side of the rear of the vehicle. Under the exhaust area, a small 5-element upper diffuser can be found. The large built-in rear spoiler doubles as an airbrake, and seems to take its inspiration from the Ferrari FXX-K, as do the LED rear light units. Underneath the small diffuser mentioned earlier, a larger full-width carbon-fibre diffuser can be found, which seems to be based on that of the GreenGT LeMans prototype car, which gives the X80 Proto a double diffuser array, not unlike those used in F1 from 2009 until they were banned in 2011. The rear features an openable hatch above where the engine is located, directly behind the split rear window. Like the Osiris, RE-7B, and Stirling GT, the car features gull-wing doors. The interior is mostly composed of carbon fibre, found around the dash, gauge cluster and central console. By default, the vehicle gains a dark-red interior around the front of the cockpit, directly under the window. Red can also be seen down the door panels. It was originally completely new and unique to this vehicle, but has since been used in several high-end super cars, including the Vagner and Visione. The entire underside of the vehicle is completely carbon-fibre plated for aerodynamics, more so than the Cheetah, as even the front and rear differentials are plated over. Because of the adjustable shocks, the suspension is extremely low, giving the car one of the lowest profile designs in the game. As expected, the X80 Proto is one of the best performing cars in the game. The car's exposed bodywork and carbon-fibre usage gives it very little weight; comparable to the Panto and Futo. As well as this, traction is equally as good due to the all wheel drive layout. The vehicle's powerful engine gives it the highest statistical top speed in the game, higher than that of the Adder by 1km/h. The car also has rapid acceleration, although several other super cars, such as the T20 and Osiris are competitive in this field. In terms of handling, the car is equipped with separate rear flaps which individually lift up and down according to both acceleration and cornering, in a similar manner to the T20. This gives the car excellent stability and control in cornering, however the overall light weight and phenomenal power still prove too much in some instances, and cause the vehicle to spin out. The flaps also serve useful in braking situations. The car's exposed bodywork mean it is incredibly vulnerable to damage and tyres being shot out, unfortunately. The car is also prone to slight oversteer when cornering at high speeds, and reducing the revs and throttle mid-way through a corner can often result in slight loss of control, but this can be easily recovered by maintaining around 6000 revolutions around corners. The engine cover/cam cover design appears to be reused from the Furore GT and Rapid GT, appearing to be a V8 engine. The engine sound, while hard to summarize, is similar to Formula 1 racing car engines, an extremely high revving engine, which seems to have the sound of a supercharger whine. Because of the high power of the engine, and the excessive amount of revolutions per minute, the car tends to backfire when downshifting. Constantly hitting the brake when at high speeds can result in large backfires which have a louder sound than any other backfires on vehicles. The X80 Proto's statistical stock top speed is 117 mph / 188.3 km/h. EMS Engine Upgrade 1 produces 119 mph / 191.5 km/h. EMS Engine Upgrade 2 produces 120 mph / 193.1 km/h. EMS Engine Upgrade 3 produces 121 mph / 194.7 km/h. EMS Engine Upgrade 4 produces 122 mph / 196.3 km/h. This makes it, at stock, one of the fastest vehicles in the game, in a straight line, tied with the Nero Custom, however when modified, vehicles such as the Banshee 900R and Pariah will exceed this speed, even if the X80 Proto is upgraded too. The X80 Proto in an official screenshot. The X80 Proto on Legendary Motorsport. The X80 Proto on the Rockstar Games Social Club. FUTUR3 X80 Proto seen in Vehicle Cargo missions. M4K3B4NK X80 Proto seen in Vehicle Cargo missions. TURB0 X80 Proto seen in Vehicle Cargo missions. This vehicle may be selected randomly as a high-class target source vehicle from SecuroServ during Vehicle Cargo missions with one of three variations: FUTUR3, M4K3B4NK and TURB0. This vehicle is classed as a Top-Range vehicle. X80 Proto "M4K3B4NK" is part of the 3-vehicle "Uninsurable" Vehicle Cargo Collection. Can be purchased from Legendary Motorsport for $2,700,000. 1.34 06/07/2016 Added X80 Proto, hidden in the game files. 06/21/2016 Released to GTA Online. Added for purchase on Legendary Motorsport. The name "X80" is an obvious reference to the F80 it is based upon, while Proto refers to its status as a prototype/concept car. Prototipo, the vehicle's file name, is also Italian for "prototype," owing to its concept car looks as well as referencing that Ferrari and its GTA counterpart, Grotti, are Italian manufacturers. The default radio stations of the X80 Proto are FlyLo FM, Los Santos Underground Radio, and Soulwax FM. Light emitted through rear aesthetics. A small glitch causes the light emitted by the taillights as well as headlights to be visible through the solid bodywork at certain camera angles. Originally, if the player brought their X80 Proto to their garage and gets out, its door becomes unexpectedly detached from the car; this can occur to its passenger door too. This was fixed in the Import/Export update. Principe Deveste Eight - An upcoming concept hypercar based on the Devel Sixteen Prototype. Visione - Another concept hypercar also manufactured by Grotti. Överflöd Autarch - A racetrack hypercar with competitive performance. 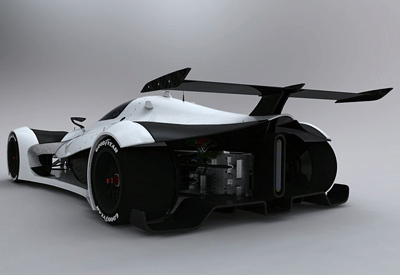 Dewbauchee Vagner - Another prototype hypercar with competitive performance. Pegassi Tezeract - Another Itialian exotic hypercar. These top speeds are not suitable for comparing cars and their performance on the road. Roads are bumpy, and bumps in the game give vehicles random boosts of speed, increasing the overall road top speed. These top speeds simply show which car has the highest statistical speed, essentially a speed which considers all the variables added to the initial raw top speed in the handling files, and do not reflect the top speed each of these cars could reach on the road or even travelling through air. Finally, these speeds do not determine which car is "quickest" or "fastest" - competing vehicles in drag races may result in unexpected outcomes, due to the fact that restricting the drag race distance may not allow certain vehicles to reach their top speed, as the acceleration of vehicles has a massive affect on their performance and reliability in racing. These statistical top speeds give all vehicles plenty of time to reach their highest top speed on a flat, indefinitely-long strip of straight track.